The kitchen was gutted on my Big Birthday, leaving us to camp in a corner of the living room with an electric skillet and microwave that more than once have overloaded the power strip, so I have learned to take turns, at least until Sergio and Jorge and Edgar finish the electrical work and turn all the circuits back on. Paper plates are the most uncivilized and literally distasteful thing about this week; I never use them even when we camp in the wilderness, so why should I have to in my own house? Must retrieve some real plates from a box for tonight, so the food will taste right again. As we were dealing with rain and illness, the weeds were taking over the yard. 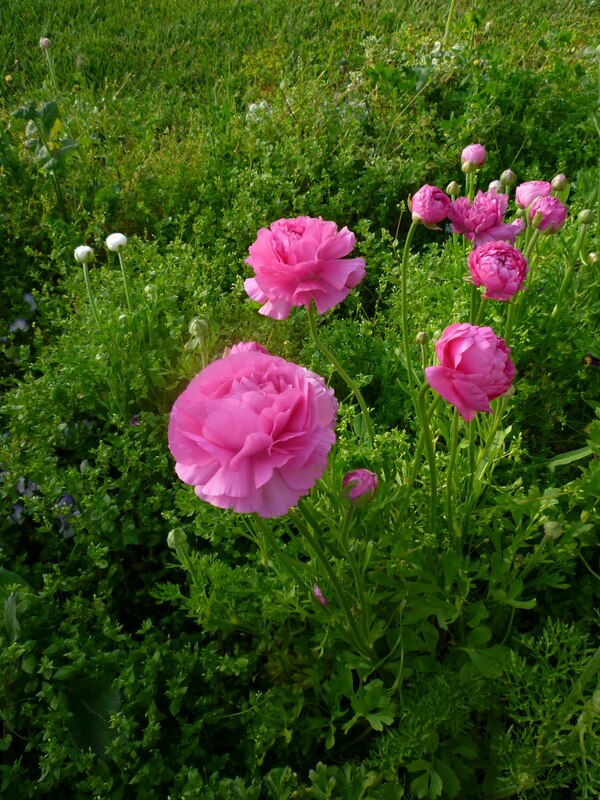 Still, ranunculus do grow tall, and these showed above the robust sea of green. One Big Event this week was the pulling of all the weeds in this bed, accomplish by moi. Today is a wonderful commemoration of a resurrectional event, when Christ raised Lazarus, so we have Lazarus Saturday, with celebrations. After the Liturgy, there is a clean-up effort to get the property and buildings all beautified for Holy Week and Pascha, but I didn’t go, because I did my such prep work at church yesterday. After shopping for plants and dirt, I planted all new plants in nine containers, ranging in size from half-wine barrels to smaller clay pots. That might not have taken five hours if I didn’t have to start by emptying three of them, heavy with old dirt, into my wheelbarrow, which I labored to drive what seemed a quarter mile to the dump pile. Then I loaded up some compost from the other side of the pile to put in the bottom of the containers. I went the long way around buildings if it helped me to avoid steps–I didn’t like trying to do wheelies. 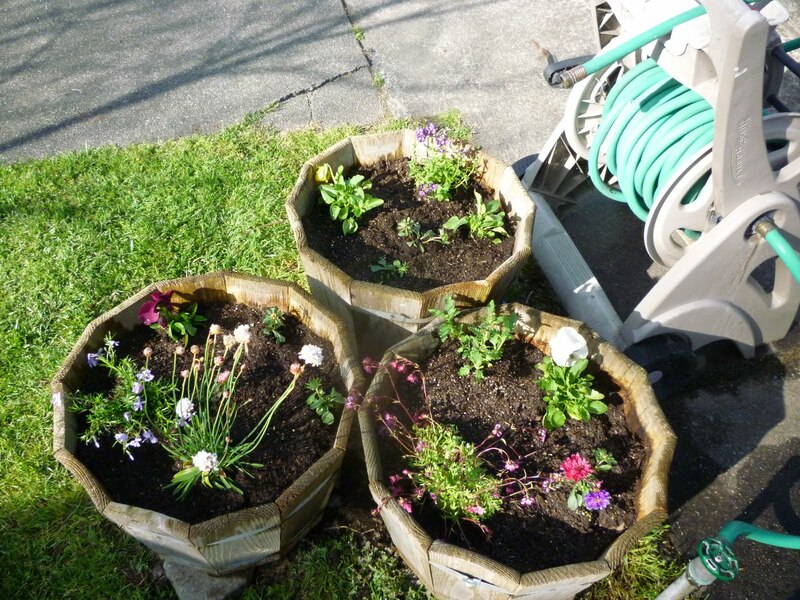 The huge bags of Supersoil I’d bought to top-off the containers were almost too weighty for an old woman. But I had heaved and dragged all four of them into my car earlier, and I managed again, to get them into the wheelbarrow, then out of the barrow on to the ground so I could grab double-handfuls of the rich stuff and nestle it around all the little flowers. The picture shows the three old medium-sized wooden containers that I’d moved from one area to another. 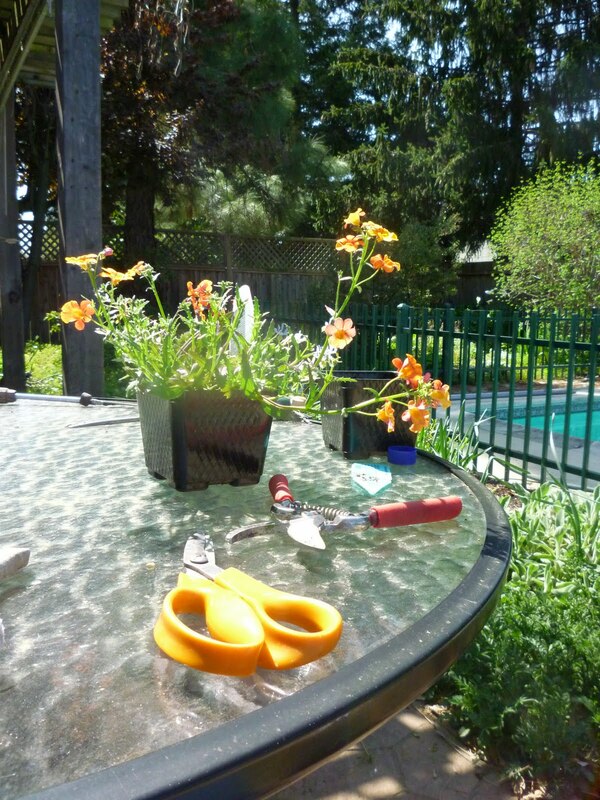 Though the weather was perfect for gardening, it was too bright for good photography. After weeding some, and cleaning up all the mess, I was surprised at how sore and tired I was. I went home in time to clean up and recover a bit, and return for Matins of Lazarus Saturday. The church had been decorated, while I was decorating the gardens, and was full of calla lilies, with palm fronds on the chandelier. Today Mr. Glad and I worked at home, and I tackled the back yard. The mass of weeds is ten times that of the front yard, but I rested at one point by this table, looked at the “trees” instead of the looming “forest,” and thanked God for the strength to work, and for the spring flowers. This pot of nemesia that one friend gave me, I’d like to put in a pot so it can spill over the sides. The children and husband and friends were so good to me for my birthday. 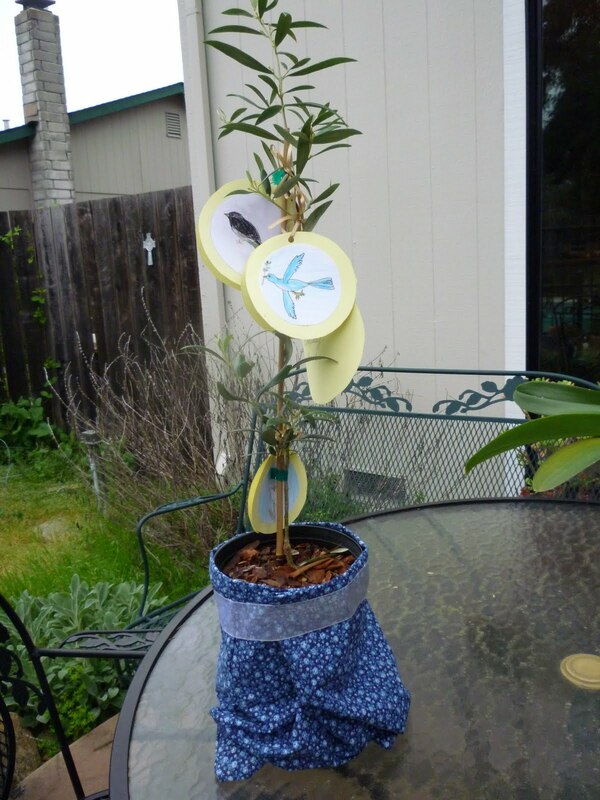 One interesting gift I received was an olive tree, hand delivered from Oregon by my son and decorated with drawings by the grandchildren. Lovely! And what a great verse from Holy Scripture! I love the pictures on the olive tree. How special! Will it live on the back patio? Love your olive tree! Happy Birthday! Birthday it up for a few more weeks – revel in the joy of blessed years! Happy Birthday! A tree is such a wonderful gift and I love the colorings of your grandbabes. You've had some busy days. I dislike paper plates…ceramic or glass ones are the best. BUT styrofoam is the worst! Your garden is going to be so beautiful!!! Sounds like you had a lovely birthday…what a nice gift. I hope the tree produces olives when it's bigger…such a unique and awesome gift! Many years, dear Gretchen Joanna! Happy Birthday! Your blog exudes such feelings of peace. Almost like walking into a peaceful garden, paper plates and all! It's just a little too early yet to start gardening here. What a thoughtful gift your olive tree is — especially with the sweet decorations. Happy Birthday! What beautiful gifts! And amazing ranunculas! I tried to plant them once when we lived in Illinois, adn they never came up. Too cold, I suppose. Happy Belated Birthday! What a wonderful gift from your children/grandchildren…. thank you for sharing it here. I wish you Happy Birthday and a long life with your lovely family.